A) Move holding block into position until wedge tip of stationery cutter is 1/2 way into V of holding block. (Stop lines are marked on the holding block). This positioning is necessary to take up forward and aft shaft end play allowing stationery cutter to move forward and aft. 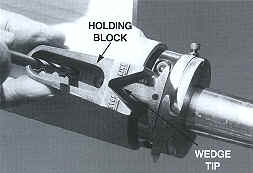 (Shafts move slightly forward when vessel goes forward and slightly aft when in reverse). We refer to this as end play. B) Drill and tap center hole first! (Photos #12 and #13). 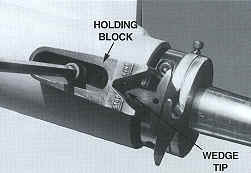 Mount holding block with one screw. Then drill and tap other 2 holes with holding block in place.